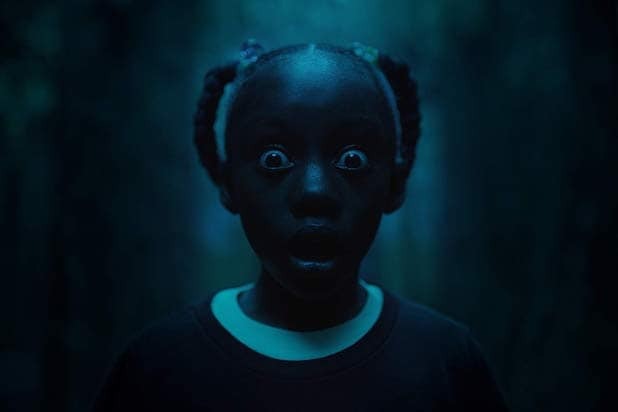 Jordan Peele's 'Us': What Does the Bible Passage 'Jeremiah 11:11' Say? If you’ve just stepped out of Jordan Peele’s “Us,” your head is probably spinning with questions. While we can’t explain the existential meaning of its themes like identity, free will and the fear of The Other that Peele poses throughout, we can help with one detail left unanswered by the film: What does the Bible passage “Jeremiah 11:11” say? If you haven’t seen “Us,” yet, some SPOILERS!!!! follow. In the opening scene of “Us,” we see Lupita Nyong’o’s character Adelaide as a young girl in 1986. While walking through a carnival on a boardwalk by the beach, she sees a homeless man with a piece of cardboard that reads “Jeremiah 11:11.” When she returns to the beach as an adult, she sees the same homeless man with the same cardboard sign, only now he’s being carted into an ambulance as a bloody corpse. Pretty doom and gloom! Although it’s certainly appropriate for a horror movie like “Us,” it’s not among the more common verses used in the movies. The book of Jeremiah is part of the Bible’s Old Testament, and Jeremiah is the second of the Latter Prophets in the Hebrew Bible and the second of the prophets in the Christian Bible. The passage in particular is part of a covenant between God and the people of Israel. God says through Jeremiah that he would protect the people of Israel in exchange for worshipping Him exclusively. But he warns of a “conspiracy” among the men of Judah and the inhabitants of Jerusalem. You could make the connection that, with this passage, Peele is referring to the bond between men and the other “tethered,” or the clones that reside in tunnels underneath the surface. And it also teases how Adelaide’s clone Red is so driven to revenge with no chance for redemption or salvation for those living above ground. Even if the passage itself doesn’t have the strongest narrative tie, “11:11” pops up again in the film. The numbers are a mirrored image, which fits perfectly with the doppelgänger themes of “Us.” And it’s also the time that’s stuck on the clock when the power in the family’s home goes out and when the copycat families in red first appear. Didn’t expect Jordan Peele to get all Biblical on you, huh? Hope that clears up at least one question. As to whether you have a clone controlling your every move and slowly awaiting to murder you, you’re on your own with that one.